Last week, during our trip up to Missoula, MT, we passed a “tiny home” being pulled by a pickup truck somewhere north of Salt Lake City. Tiny homes are usually small, wooden cabins that are built onto a trailer bed. It was the first time I had ever seen one in person, though goodness knows I had read about them for years. Jay Shafer is credited with creating the “tiny house” movement, which in a very un-American way, suggests that you/I/we can live happily in a “house” the size of a large area rug. I bought Shafer’s tiny house book in 2012 and would flip through the pages, dreaming of building a little cabin that my family could wheel out into the woods. Unfortunately, my wife had absolutely no interest in the idea at all. When I mentioned my small house sighting to my sister, she mentioned that she had read The Big Tiny: A Built-It-Myself Memoir and thought that I would enjoy it. It was a fun read over the Thanksgiving holiday. Dee Willams was a mid-life, mid-career professional living in Portland, OR when she collapsed in 2006 from undiagnosed congestive heart failure. Deciding that she needed a radical change, Williams decided to build her own tiny home in a neighbor's driveway. The story of designing and building the ultimate DIY project, downsizing her possessions, and creating a new life in the backyard of her friend’s Washington home make up the majority of the book. I think there are three big reasons that they have such an appeal. First, tiny homes are a minimalist’s fantasy abode. Who hasn’t envisioned throwing away 90% of their belongings and hitting the open road? With their postage-stamp footprint, a tiny house presents a lifestyle free of large, bulky possessions. Second, they a present a frugal alternative to standard homeownership. The average home price in America is $199,000, though it can be many times that size in bigger cities like Los Angeles ($570k), New York ($788k), or San Francisco ($1.25mil). The vast majority of tiny homes cost somewhere between $10,000 to $30,000 to build. Depending on where they are placed, owners pay just a fraction of the cost to live than their more rooted brethren. 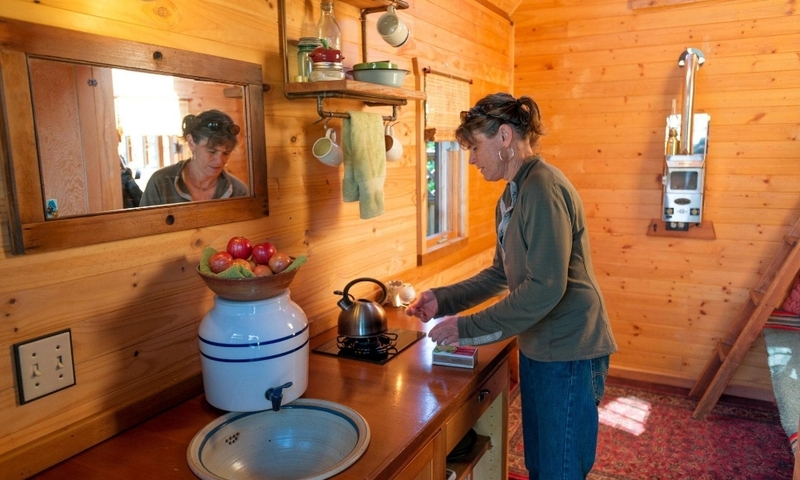 Third, tiny homes represent personal freedom from the day-to-day grind. If you are forced to throw out the majority of your possessions and have a much smaller cost of living, what is the reason to have a high-stress job? These are questions that Williams was forced to ask herself soon after transitioning to her new home. Shortly after building her home, she stepped away from her career and became a caregiver to a friend’s aunt and volunteered around her community. The Big Tiny is partly a memoir on the process of designing and building a house that could move with her from open field to a friend’s backyard, and partly a meditation on what it means to live “small” in America. Williams writes about the ideas of materialism, success, happiness, and what home/community means when you dig beneath the most obvious choices.